Today is dedicated to the efforts of Chris White, my PhD student who is soon leaving us for Zurich, where he will work as a postdoctoral associate at the ETH in the laboratory of Professor Jeff Bode. 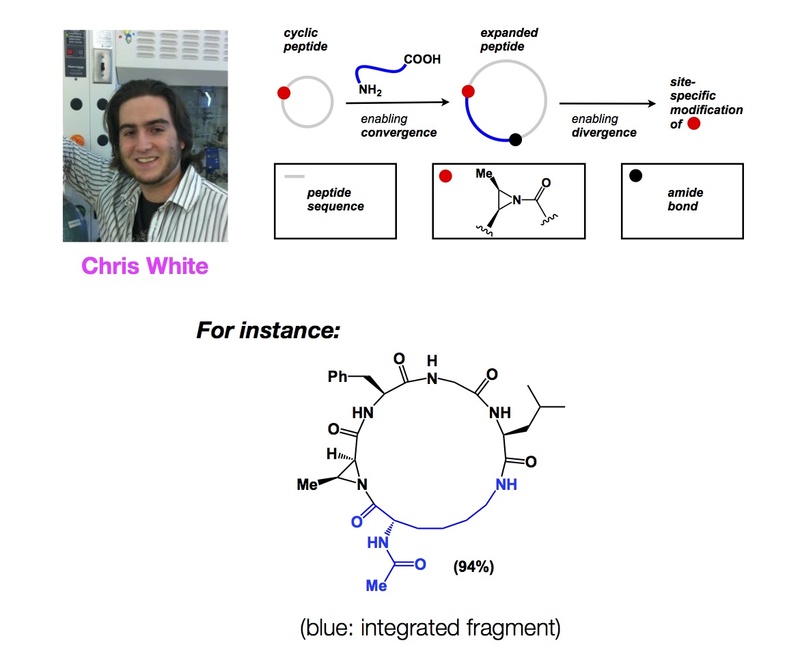 Over the past 3 years, Chris has been painstakingly perfecting a reaction that amounts to insertion of amino acid fragments into cyclic peptides. While there is no precedent for integrative operations in the realm of synthetic chemistry, nature is known to do it. One particularly well-known process in biology involves integration of DNA fragments into host chromosomes. This function-driven insertion of “foreign” fragments into existing biological entities has far-reaching consequences. When we think about synthetic challenges in our lab, we often draw inspiration from nature. Several years ago we asked a question: if the retroviral enzyme integrase can do it by binding both termini of viral DNA, can we think of a reductionist approach to this process? 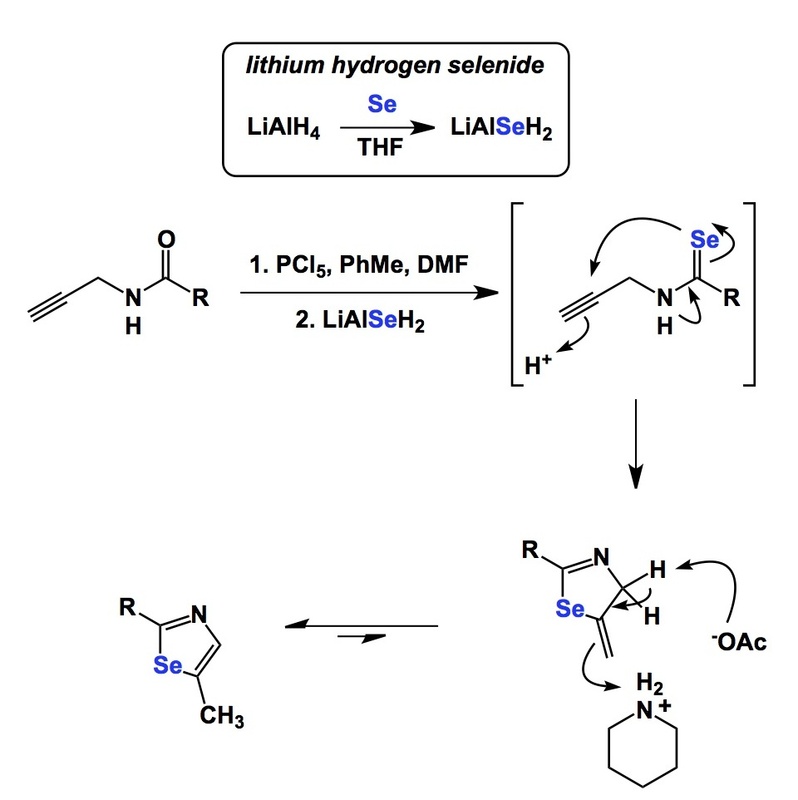 How about instead of DNA and enzymes we teach some new tricks to lithium hydroxide and simple coupling reagents? Chris has capitalized on the susceptibility of N-acyl aziridines to amide hydrolysis – their “Achilles’ heel” – and developed a tool to site-selectively incorporate molecular fragments into cyclic peptides. We think that this method should be readily adaptable to solid phase synthesis, be extended to split and pool protocols using molecular fragments of varying diversity, and help create non-amide bond forming approaches to fragment integration. Our lab will now actively work in these directions. Thanks Chris for your trailblazing efforts! I flew into Boston last night and had a great time at the Chemistry Department (Boston University) earlier today. A special thanks goes to Professor Aaron Beeler, my main host, who is running an innovative program in flow synthesis, bioactive molecule synthesis, and reaction discovery at BU (http://www.bu.edu/chemistry/faculty/beeler/). I met Aaron last Summer at the Gordon Conference on High-Throughput Chemistry and Biology, where he invited me to visit his storied department. I just came back from our dinner at the Eastern Standard (awesome oysters there, ladies and gentlemen) with Aaron and Professor Scott Schaus. While we were having our drinks at this fine establishment, I kept thinking about the significance of much smaller amounts of alcohol. 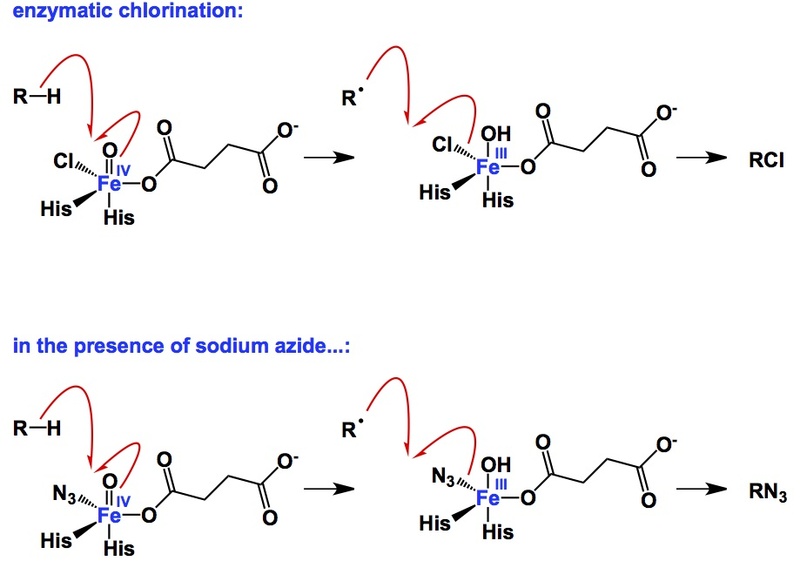 Sounds like an oxymoron, I know… What I mean is this: while talking to Scott earlier in the day, I was reminded about the significance of achiral additives in asymmetric catalysis. 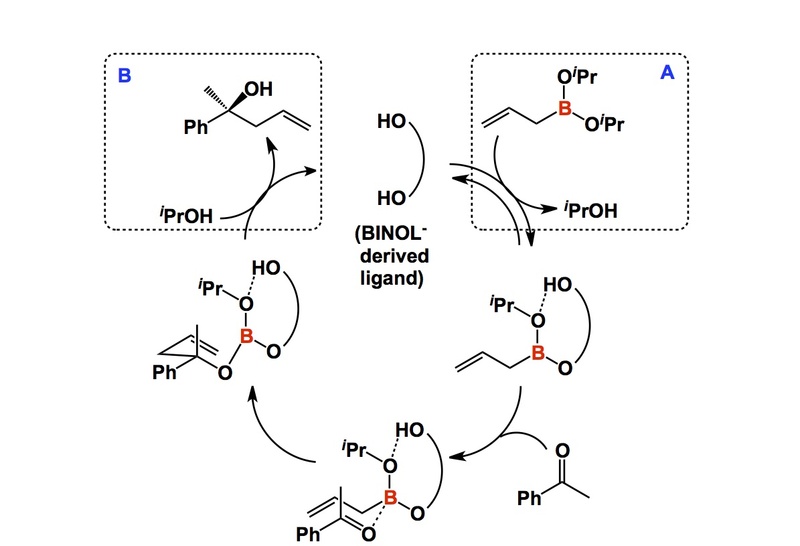 Below is a link to the Angewandte paper by Scott, who discovered a superb ketone allylation process and spent several years perfecting this catalysis. Ok, I am off to bed – catching a 6am flight back to Toronto, where I am giving two lectures in my graduate class and second year organic class tomorrow… Thankfully my student Adam filled in for my CHM 249 class today! situ using LiAlHSeH. The method is concise and user-friendly. How about doing it in fluo? I already mentioned a sustained current interest in flow chemistry. I am a believer in this method. It is interesting to see reports where chemistry is run in thin capillaries where residence time rules. This parameter is unheard of in our typical “flask-based” reactions. Of particular significance to me is the paper by my former PhD student, Zhi He, who is now doing his postdoctoral work with Tim Jamison at MIT. Zhi’s manuscript, which just came out in Angewandte, documents a flow approach to phenols starting from Grignard reagents. 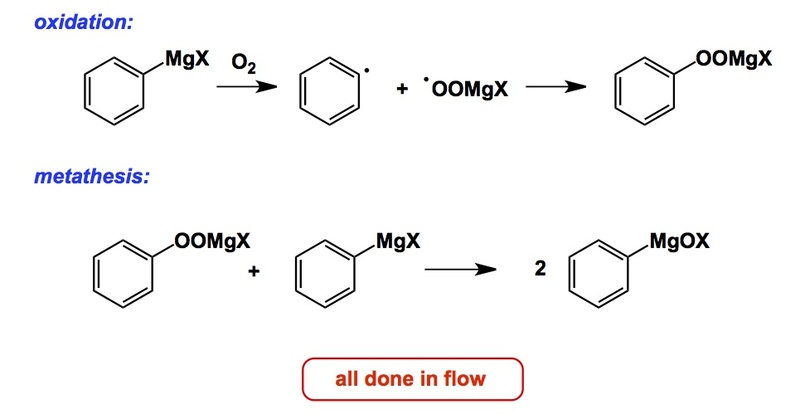 This work serves as an example of an economical approach to phenol synthesis, whereby aryl Grignard reagents are directly oxidized using compressed air in “continuous gas-liquid segmented flow system”. Many functional groups are tolerated in this process. What’s interesting is that the determined reaction profile prescribes the optimal region of pressure/temperature around -25 oC and 200 psi. An opportunity to quickly scan the 2D pressure/temperature grid is powerful. The concept of residence time is critical to the success of flow approaches and, given the importance of kinetics in chemistry, there is potential to look at space/time control of REALLY exotic intermediates. In vivo, in vitro, in silico… How about in fluo? After all, “fluo” is the Latin for flow. Have you heard anyone refer to flow synthesis this way? I just thought about this term now, but there are probably precedents of its use out there. Nerve agents are scary molecules. Thankfully, there is an antidote for pretty much anything, but only if taken at the right time (recall all those old Hollywood action movies…). There is a very interesting Swedish structural biology paper that describes molecular-level interactions between a series of nerve agents and their target – acetylcholinesterase (AChE). 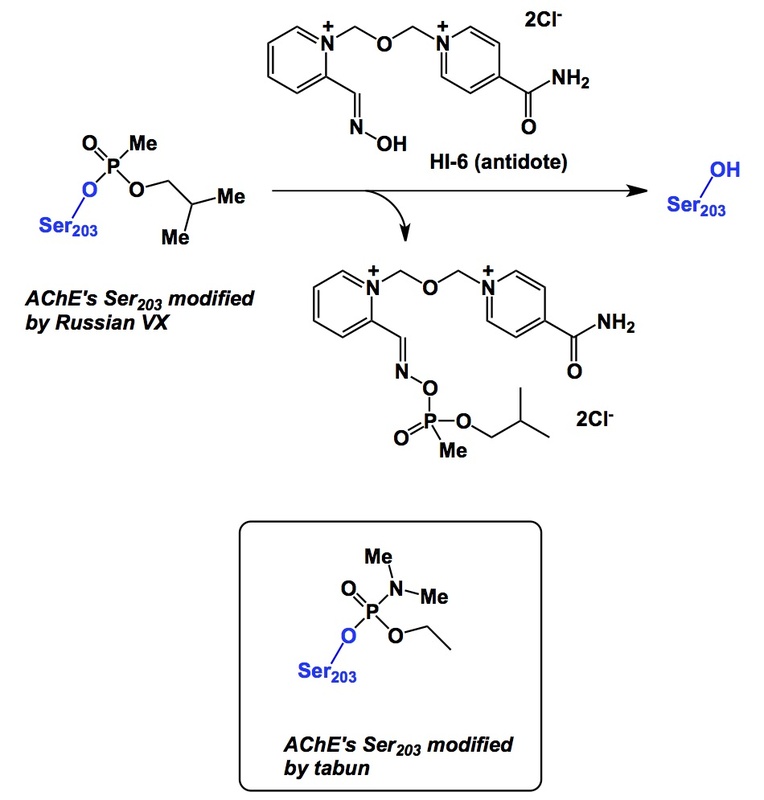 Nerve agents are fairly simple organophosphorous compounds that wreak havoc by covalent modification of Serine-203 in the active site of AChE. HI-6 is an oxime-containing antidote for several types of phosphorous-containing nerve agents. This oxime is remarkably efficient, acting as a competing nucleophile that reacts with the phosphorus center of the modified AChE, thereby restoring its normal enzyme activity. Is there a better way to demonstrate the marvels of chemistry? Everything here makes sense from the standpoint of simple polar interactions. 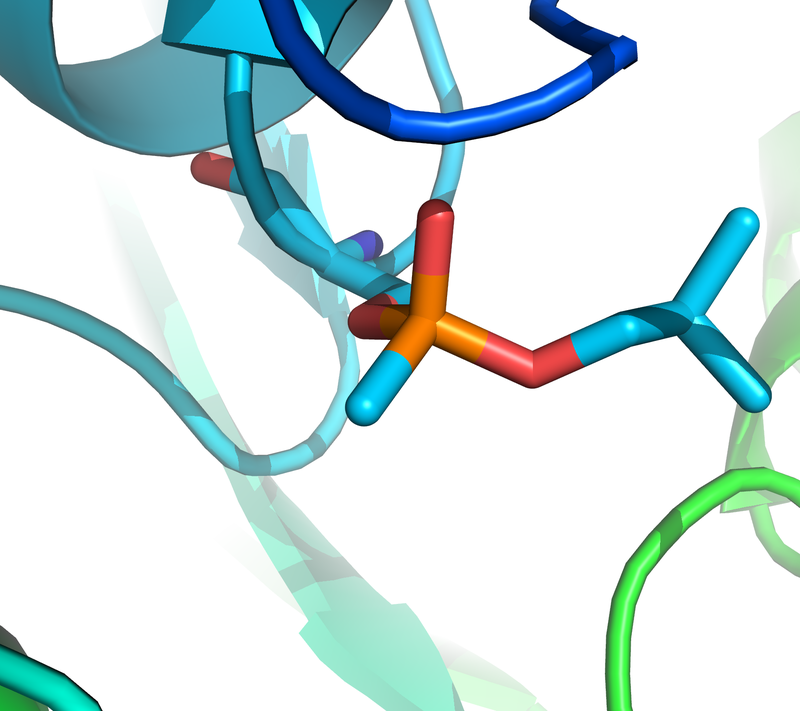 Below I am showing a crystallographic view of Russian VX-modified AChE as well as the reaction of HI-6 that restores enzyme activity. The paper is remarkable because it also provides evidence why HI-6 fails with certain kinds of nerve agents such as tabun (tabun-modified Serine-203 is shown in the box). Apparently, the Phe338/His447 array close to Serine-203 reduces the conformational mobility in the tabun-AChE complex. The steric interactions interfere with the approach of oxime-pyridinium group of HI-6 to the phosphorus atom of the adduct. The kinetics of reactivation are thereby significantly slower and other (smaller) antidotes need to be designed.